Since I received this release for review I've never had it out of the CD player, such is the pleasure I've gleaned from the intelligent and compelling musicianship on offer. For those unfamiliar with Rafał Blechacz, he's a Polish pianist, now in his early thirties. He came to public attention in 2005, when he won the International Fryderyk Chopin Piano Competition in Warsaw. It was no mean feat that he was the sole recipient of all five first prizes, taking not only First Prize but also the polonaise, mazurka, sonata, and concerto prizes - the first pianist ever to achieve this distinction. Piotr Paleczny, vice chairman of the jury, said that Blechacz 'so outclassed the remaining finalists that no second prize could actually be awarded’. On the back of his success he signed a contract with Deutsche Grammophon the following year. In the meantime he’s made several albums, mainly focusing on Chopin. This is his first recording excursion into the world of Johann Sebastian Bach. I would recommend purchasers to initially make a beeline for the Fantasia and Fugue in A minor, BWV 944. What stunning virtuosity! I can’t understand why DG didn’t programme this at the beginning. After the wonderfully rich arpeggiated chords of the Fantasia, the Fugue is a tour-de-force, played at an energetic speed, with razor sharp precision. Everything is clear and flawlessly delineated. The Italian Concerto, seemingly outnumbered recording-wise with harpsichord versions, works well on the modern concert grand, and Blechacz's reading is couched in a bright sonority. He's no stranger to the score, and has programmed it frequently in concerts. Brisk tempi are favoured in the outer movements, and there's a real sense of forward momentum. You can view him playing the opening movement on Youtube, and the joy and engagement he has with the music is palpable. The Andante shows the more profound and reflective side of his character. Exquisitely contoured with a luminous tone, the sublime aria unwinds expressively over a discreet ostinato bass. The Partitas Nos.1 in B-flat Major and 3 in A Minor are made up of dance movements. Blechacz plays them to the manor born. Impeccable, cultivated and sparing of pedal, there’s a consistency of fine detail, with ornamentation neatly stylish. The First Partita has always been more popular, and I prefer it of the two. The opening Praeludium is sufficiently elegant and flowing, with the Allemande's fleet-footed delivery reminiscent of Lipatti. The Sarabande is heartfelt and persuasively etched. In the Minuets he achieves contrasts by varying articulation. Crisp percussive fingerwork alternates with more legato rendering. In the Minuet 11, the repeat of the first half is played an octave higher as per Gould and Anderszewski. The Gigue is rhythmically bouncy and briskly paced, ending the work in a blaze of glory. I'm pleased that the Four Duets BWV 802-805 have been included. They're not that well known. Richter and Nikolayeva's recordings have always stood the test of time. Clarity of articulation and dynamic gradations fuse to make Blechasz's take on them every bit as fine. To round things off, the recital ends with an intimate reading of "Jesu, Joy of Man's Desire" in the Myra Hess transcription. These superlative performances are enhanced by the pleasing sound quality and attractive acoustic of the chosen venues. 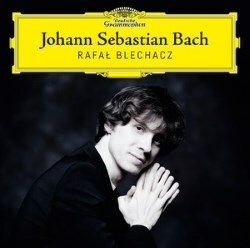 Blechacz also has the advantage of an expertly voiced piano, with a rich, warm timbre. This is an immaculately executed recital, enhanced by meticulous attention to detail and constitutes a resounding success. A natural Bach pianist, let’s keep our fingers crossed that the composer will feature in subsequent endeavours. This will probably go to the top of my list of Recordings of the Year.